Nicholas Okwulu of social enterprise Pempeople and Ulrike Stevens of what:if projects are neighbours who joined forces to develop plans for the transformation of 60 vacant garages on the Ledbury Estate on Old Kent Road. Located in one of the most deprived wards in Southwark, the project addresses the need for training and support in an area with high youth unemployment and low levels of educational attainment by creating a community hub with spaces for workshops, studios, cooking lessons and cultural activities where people can learn and socialise. In August the Old Kent Road Studios hit their crowdfunding target of £54,000 after receiving backing from over two hundred local residents, businesses and a £20,000 pledge from the Mayor of London as part of the GLA’s crowdfunding initiative. This then triggered another £50,000 from the Old Kent Road’s Tenant and Resident Association which was matched by Southwark Council. The next stage of the project is about to commence and the team are calling on everyone to get involved and offer their time and skills to help bring the space to life. 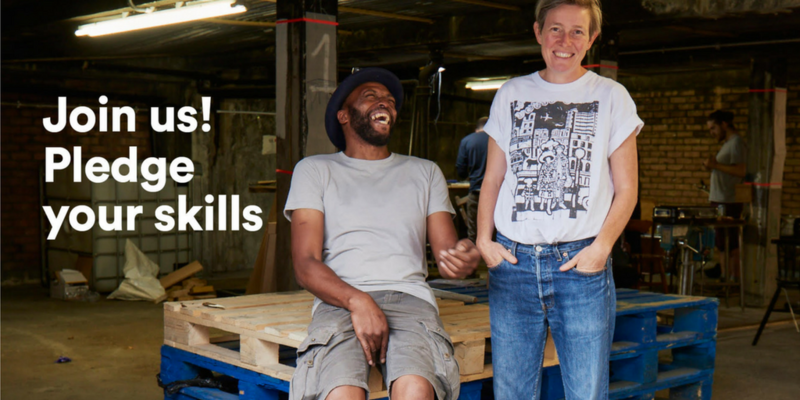 Whether clearing and painting or helping run workshops in carpentry, metal work or graphic design, they are now looking for people’s time and energy to help transform the space. Help power the Old Kent Road studios and offer your time and skills over at spacehive.com/OKRStudios.